Washington Square Press, 9780671003753, 480pp. The paperback edition of the beloved, bestselling novel about Dolores Price and her heartbreakingly comical coming-of-age journey. Meet Dolores Price. She's thirteen, wise-mouthed but wounded, having bid her childhood goodbye. Beached like a whale in front of her bedroom TV, she spends the next few years nourishing herself with the Mallomars, potato chips, and Pepsi her anxious mother supplies. When she finally rolls into young womanhood at 257 pounds, Dolores is no stronger and life is no kinder. But this time she's determined to rise to the occasion and give herself one more chance before really going belly up. 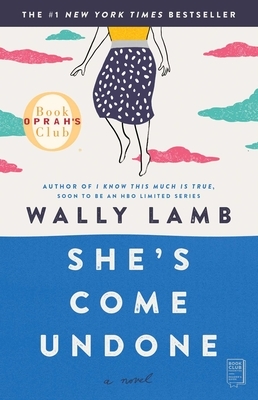 In this extraordinary coming-of-age odyssey, Wally Lamb invites us to hitch a wild ride on a journey of love, pain, and renewal with the most heartbreakingly comical heroine to come along in years. At once a fragile girl and a hard-edged cynic, so tough to love yet so inimitably lovable, Dolores is as poignantly real as our own imperfections. She's Come Undone includes a promise: you will never forget Dolores Price. Wally Lamb's fiction and nonfiction have appeared in Pushcart Prize XV: Best of the Small Presses; The Best of the Small Presses; The Best of the Missouri Review; Streetsongs 1: New Voices in Fiction; Northeast and The New York Times Magazine. He is the recipient of an NEA grant for fiction, and is a Missouri Review William Peden fiction prize winner. A nationally honored teacher of writing, and a graduate of the Vermont College MFA's Writing Program, Lamb lives in Connecticut with his wife and their three children. His first novel, She’s Come Undone, was an Oprah Book Club Selection, and has since sold millions of copies. He is also the author of the bestsellers I Know This Much Is True, The Hour I First Believed, and We Are Water. Glamour A heroine to cheer for....This supremely touching journey to adulthood may remind you of The World According to Garp and other sagas of emotional liberation.